ABA was founded in Sweden in 1896. The ABA Group of companies has since grown into a leading multinational group specializing in the design and production of hose and pipe clamps and connectors, for many applications. ABA hose and pipe clamps are available in many types and standards, to deliver the highest possible clamping-force and tightening and breaking torque in every situation. ABA is one of the few manufacturers in its field with extensive in-house system-testing facilities. The best-known ABA product is the Worm-gear clamp (Swedish Standard SS 2298), remarkable for its unique one-piece, pressed housing. The ABA Original worm-gear clamp is also known as “the blue housing clamp” or “the professional clamp”. ABA products use the highest quality steel. Using specially produced tubes, we press our ABA Original worm-drive housings into their final form in one single step, to achieve a jointless housing of optimal strength. The highly general ABA Nova clamp is the ideal choice for smaller dimensions of hoses. The worm gear&nbsp;housing is manufactured in a closely monitored puzzle lock housing construction. The base of the housing&nbsp;is cut back and the internal tolerances are very close: a few hundredths of a millimeter. It is available for a&nbsp;wide range of hose dimensions and retains its roundness and sealing qualities even on the smallest of hoses.&nbsp;All parts are made of SS 2343/AISI 316 stainless steel, in accordance with Swedish Standard 2298. 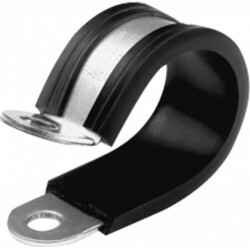 The acid resistant clamp is produced from SS 2343/AISI 316 high tensile strength steel. It has one of the&nbsp;best clamping force ratings in the world thanks to its special thread design and manufacturing methods.&nbsp;Whenever required, this clamp has a very high clamping force and premium corrosion resistance. This&nbsp;clamp has received high praise from US Powerboats and is used worldwide by quality marine equipment&nbsp;manufacturers, amongst others. 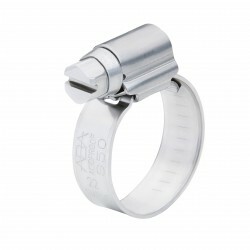 All parts are made of SS 2343/AISI 316 stainless steel, in accordance with&nbsp;Swedish Standard 2298. 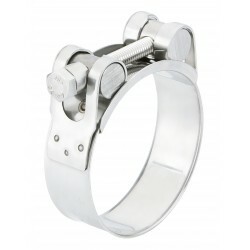 Robust is a heavy-duty clamp with rolled-up band edges. It is used in many applications such as for sealing heavygauge&nbsp;reinforced hoses used for exhaust systems &amp; cooling systems. Robust Acid Resistant-AISI 316. All parts&nbsp;are made of Swedish Standard 2343 &amp; AISI 316 stainless steel.